What is Bright Cluster Manager? Bright Cluster Manager for HPC lets you deploy complete clusters over bare metal and manage them effectively. It provides single-pane-of-glass management for the hardware, the operating system, HPC software, and users. Deploying: With bright, it takes the pain out of deployment. Simply answer a few questions and the wizard does the rest. Monitoring: Bright provides a powerful GUI with comprehensive metrics and alerts you when there's trouble. Automatic health checks keep an eye on the cluster for you. Management: Choose between graphical or command line UI to get your work done. Optimizes use of your IT resources and includes HPC tools and libraries. Bright Cluster Manager lets you administer clusters as a single entity, provisioning the hardware, operating system, and workload manager from a unified interface. This makes it easier to build a reliable cluster. Once your cluster is up and running, the Bright cluster management daemon keeps an eye on virtually every aspect of every node, and reports any problems it detects in the software or the hardware, so that you can take action and keep your cluster healthy. The intuitive Bright management console lets you see and respond to what’s going on in your cluster anywhere, anytime. Install everything you need, including your chosen distribution of Linux, workload manager, libraries, and more. 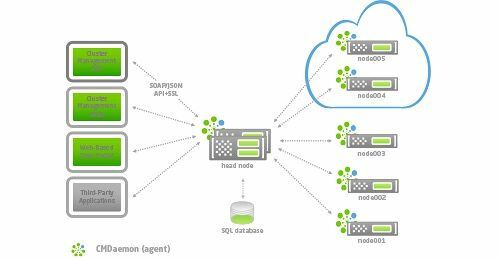 Handle the provisioning of software images to nodes with ease, for clusters of virtually any size and complexity. A single, intuitive interface for all cluster management functionality. Monitor, visualize, and analyze a comprehensive set of hardware and software metrics with ease. Leverage powerful GPU management and monitoring capabilities to gain maximum control. Easily create new clusters in the cloud, or add cloud-based resources to your existing clusters on-the-fly.